We have been trying to take advantage of these spring like days to get as many sap lines run as possible. Trips to town start early in the day and consist of a running list 0f supplies to be purchased at Lowes and Tractor Supply, then back to the farm. 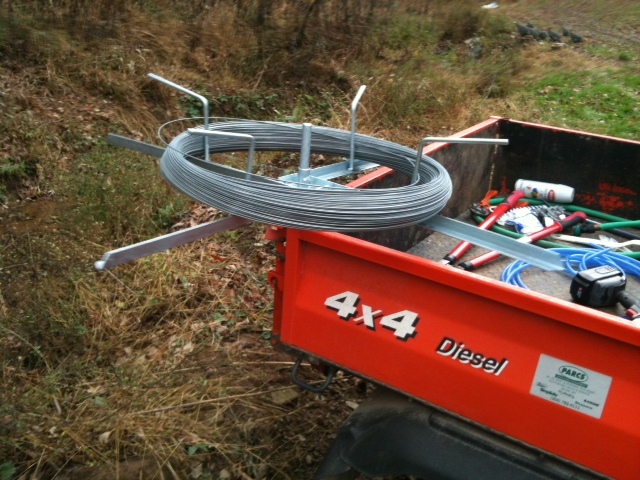 Sonny has been running the 12.5 gauge high tensile strength wire used to hold up the main sap line for a week now. We later go back and tie the 3/4″ main sap line to the support wire. Once that has been completed we will finally connect up the 5/16″ lateral sap lines or blue lines as we call them. Hopefully we will be finished before freezing weather and the first big snowfall. All that will be left to do is tap the trees when maple syrup season starts in February or March. Main sap line attached to wire. We use a spinning jenny wheel to guide the wire as we pull it up and down the hillsides. Otherwise the roll may become tangled and Sonny or I might roll down the hill with a wire slinky tumbling after. The Spinning Jenny is a great timesaver. Every few months through out the summer we have purchased additional 35 gallon sap tanks (pigs) that will be placed at the end of each main line to collect the sap each day. Then we will pump the sap into another tank in the back of the RTV and transport it to the sugar shack. This will be much easier than the bucket method we used last year. We anticipate that it will take a couple of more years to finish connecting lines to the rest of the Maple trees on our property, but for now we have enough trees to keep you all in syrup. Well lunch break is over and I need to don boots and work gloves. The Master syrup maker is calling. Sonny has been working hard to get the sugar shack completed before the maple season starts in February and March. I do believe he eats, sleeps and dreams about maple syrup. That is a good thing for all of you because it means he is passionate about maple syrup and will do his best to produce the best maple syrup in West Virginia. Yesterday we crossed a big milestone. The evaporator and tanks are all in place so we did a little test run of the system. Sonny filled the large holding tank with water and we watched as it flowed down the pvc pipe into the evaporator. He worked up a system to where we will not have to use buckets to pour the sap into the evaporator. 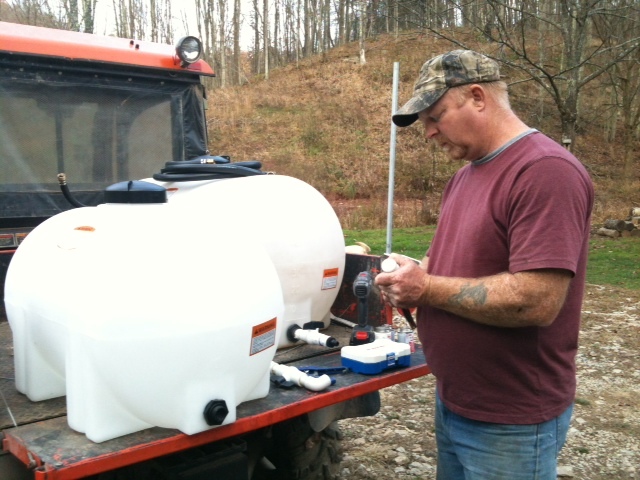 Instead he will pump the sap from a tank in the back of the RTV into another holding tank that sits higher than the evaporator. He can then control the amount of sap that is put into the evaporator by the use of shut off valves. Confused? Maybe a few pics will help. The day was cool and perfect for starting a fire in the wood stove or wood furnace as Sonny calls it, that will heat the sap and boil off the water. 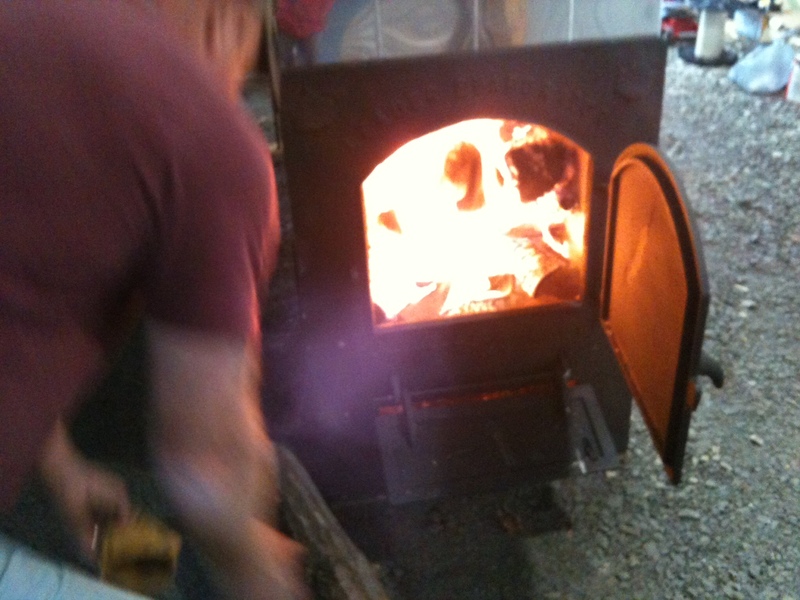 We could smell the newness of the wood furnace and evaporator as the metal warmed up. Soon the water began to bubble, creating steam that rolled up from the evaporator like an ethereal smoke. It made its escape to the outside through open vents along the sides and top of the sugar shack. To look at the outside of the building one might think we had a moonshine still working in there. We still have a few things to tweak to finish up, but this dry run was a success. Today Sonny is out running lines to the new trees we marked. I will have more on that tomorrow. I really hope to give you all a play by play of the maple syrup production so you can be a part of the process and when you pour that sweet amber syrup over your pancakes and watch in anticipation as it drizzles down the sides, you will know exactly where it came from and what had to be done to get it. 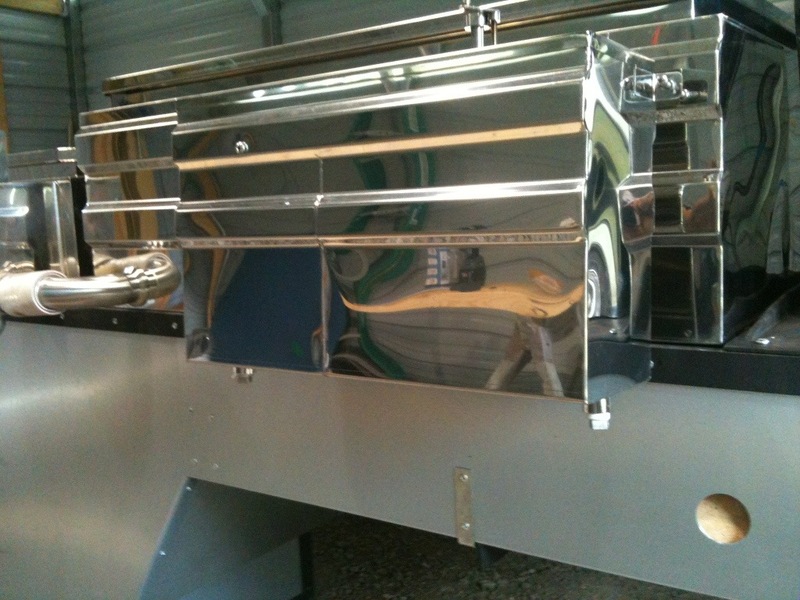 Last Monday the Sap Evaporator was finally delivered from Leader. I went through Anderson’s Maple Syrup for my order and advice. I purchased the American model because that one fit the amount of taps that I hope to eventually get to. So far we have only done a fit check and dry assemble. Now we have to rent a wet saw to cut about a dozen fire bricks for the tunnel. Once that is completed the drop flue pan and the syrup pan can be put in place and a simulated sap cook will begin with water. 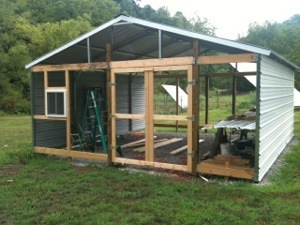 We have been slowly making progress on our Sugar Shack. If all goes well we hope to have the ends closed up in the next 2 weeks. Sometime in September we are expecting the delivery of the evaporator system and that installation will begin. Syrup season is just around the corner. We still have many more Maple trees to connect up this year, if all goes well we hope to add another 100 taps. Bring on Winter. We had a wonderful visit today with one of our readers, Luann Barbagallo, who stopped by to pick up two pints of syrup and to see just what PHF was all about. Luann and her family are starting their own homestead in a nearby county. I’m not sure what pearls of wisdom we had to offer as Luann has twenty years of gardening, canning and raising milk goats under her belt. That experience will go a long way in starting a homestead. I hope to keep in touch Luann, you never know, we may need some milk goat advice when we finally get to that stage. 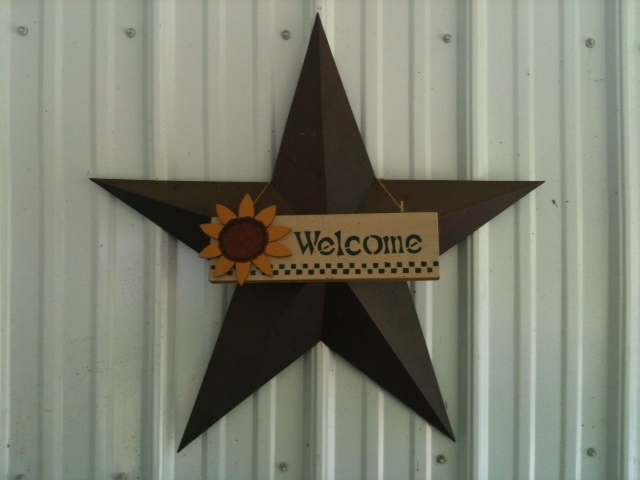 We showed her how the off grid system worked and then took a tour of the farm, stopping by to see the princess piggies. The girls were on their best behavior and allowed Luann to view the pig palace set up. She was interested to see what methods we use to raise our pigs since she and her husband will be purchasing their own feeder pigs in just a few days. We showed her the smoke house where we smoked eight hams last fall, because if your going to raise pigs you have to have a smoke house. She whole heartedly agreed. In the past few years we have come to know several homesteading families and one of the nice things about it is that we all share ideas. Everyone has abilities that can help another. We are all folks who choose to live a simpler lifestyle, who choose to leave the whirlwind world of consumerism and depend on our own ingenuity to provide for ourselves. It was a great experience to meet someone from our blog family of readers. Luann, thank you so much for stopping by, we thoroughly enjoyed your visit. Wish you lived a little bit closer. You and your husband are always welcome. I know I have been lax on updating the blog on a daily basis and it is not that I don’t wish to, but we have been super busy as of late. So I will give you a run down of activities from Saturday. Our day started early with a quick cup of coffee and a fried egg sandwich. We donned our winter duds of flannel shirts under insulated carhartt coats, snow boots, wool hats and gloves. The cold wind blew around us like an angry banshee as we fed the chickens and released them from the coop. They gathered around the feed bowl, feathers puffed and ruffled. Stray snow flakes landed on our shoulders and we wondered if the pruning class would still be held on schedule. No matter, we made a commitment and Carol would be waiting at the country store for us to pick her up. Our new neighbors and friends Bill and Paula Guinazzo and Paula’s mother Nellie followed behind us as we drove the curvy roads towards Richie County. We hit pockets of snow in some areas and others were clear. We stopped at the McDonalds in Ellenboro and enjoyed a cup of coffee before going on to the pruning class. We drove up a long drive that led to a farm situated on rolling hills. The view was breath taking. The family hosting the class raise grass fed beef cows and have an orchard of young apple, plum and peach trees as well as grapes and berries. We were surprised to see a large group of cars and trucks parked in front of the house and were glad that we weren’t the only people crazy enough to come out on such a bitter cold day. Close to fifty people crowded into the two car garage. We were lucky enough to get a seat at one of the tables, others had to stand. 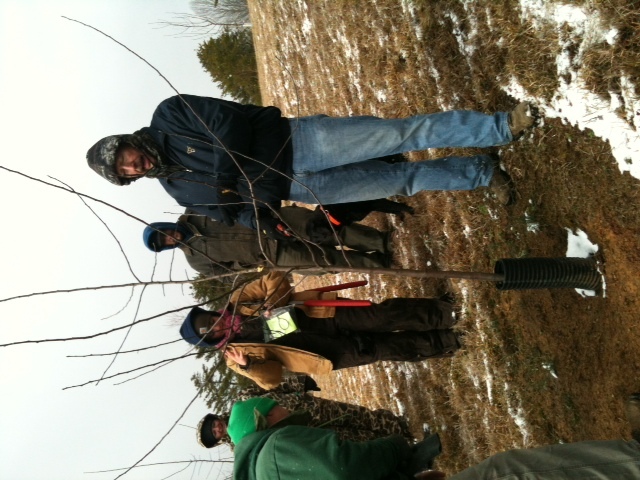 The instructor showed us the various tools for pruning berry bushes and fruit trees. 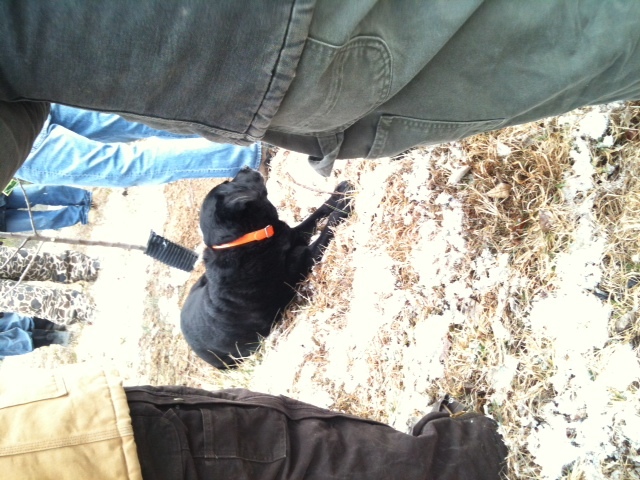 He showed us the proper way to prune and answered questions. After lunch we went outside to the orchard. Old man winter blew out his icy breath, trying to scare us all back behind closed doors, but these were all folks of substance and grit. People of the land, un-thwarted by the elements. The instructor went from fruit trees to berries, trimming away unwanted growth. I would like to say that I retained all the info, but that would be lie. Thats not to say that we all didn’t learn something. It was an informative class and we learned a few tricks about pruning berry bushes and grapes which is what we came for. Rose has pruned off a twig of her own. Good Dog. This was an exciting day because we bottled up syrup for the first time. We took another eight gallons of sap over to Twolynns Farm and added it to the other sap. 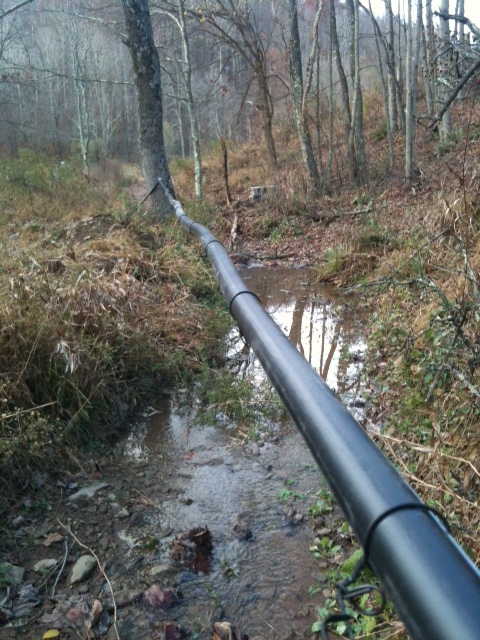 So far we have taken seventy-six gallons of sap to be processed into syrup. Sandi had a gallon of sap already processed in four quart jars waiting for us. 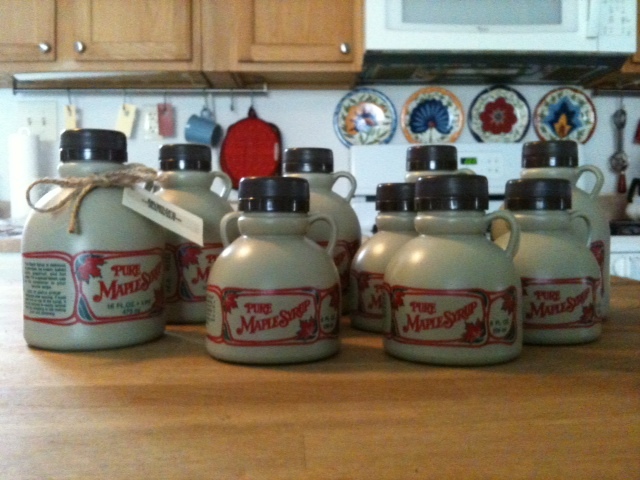 We brought over some of our newly acquired plastic syrup jugs that we had ordered from Sugar Bush Supplies Co. Sandi and I boiled the jugs just like you do when your canning. We heated the golden syrup to boiling and then poured it into the jugs. That simple. 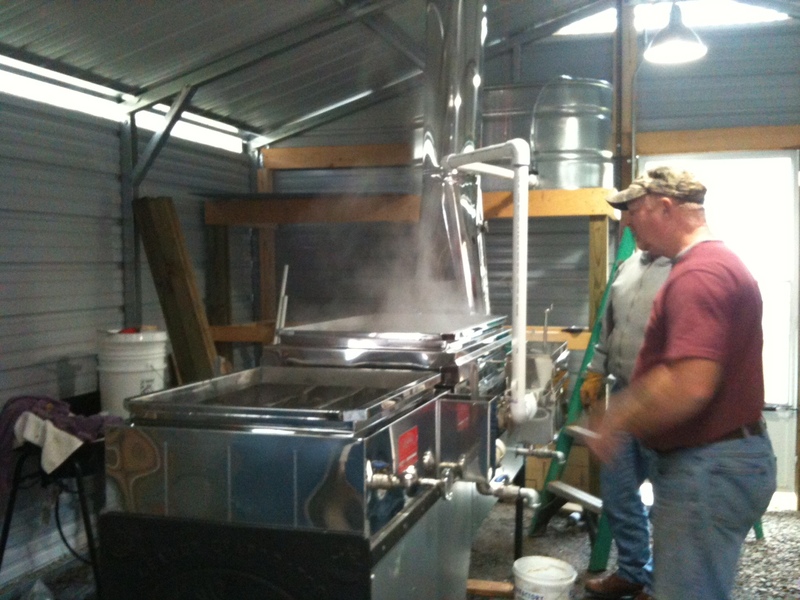 Sonny and Lynn were out in the sugar shack keeping the fire stoked and processing more syrup. It takes hours to boil off the water from the sap to get it to that sweet golden syrup you enjoy at your table. Mmmmm good! I will have to finish more of this update tomorrow. Sonny is calling me and its time to recheck the sap buckets. You are currently browsing the archives for the Maple syrup category. We are on an adventure learning the ropes of starting a small farm, being self-sufficient and living in a 100 percent off-the-grid solar powered home. We'll share the ups and downs of raising chickens, pigs, growing a garden, and life in general, all with a twist of humor thrown in for good measure. Enter your email address to subscribe to this blog and receive notifications of new posts from my Blog by email. Sonny on Where have we been? Guy Dent on Where have we been? Robert Loar on Where have we been? librarynbct on Where have we been? bobusn on Where have we been?